Cornwell's Arthur Series has inspired me to raise a Romano-British army for De Bellis Antiquitatis. I am using II/81c Sub-Roman British. To start off I painted the above spear element using all Hat figures. I'm not sure how soon I'll finish the whole army, but I really wanted to get this element done while I'm still reading. On the left is Nimue, the druid. She is from set 8140 Gallic Chariot with Warrior Queen. Next is Lord Derfel. 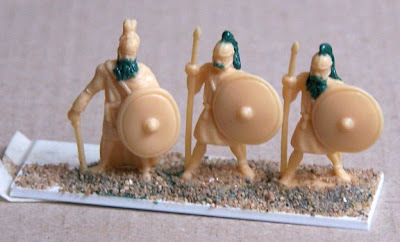 He and his spearmen are from 8100 Hat's Late Roman Medium Infantry. The models are un-armored, but I found that by poking the soft plastic with a pin it created a nice chain mail effect. I used putty to add the beards and the wolf tail helmet crests. The shields are painted with stars, which is described in the novels. It looks like this could be the general element, but the DBA Sub-Roman army list only assigns the general to cavalry or knights. I can't wait for Hat to release it's 8183 Late Roman Medium Cavalry! The sculpts look great and will be perfect for Arthur and his cavalry. Now that I have read the novels I realize that Gripping Beast has a 28mm set inspired by Cornwell's books. I have long admired these sculpts, but hadn't realized the inspiration. The Winter King came out in '96, but I only just read it! See ABR11 Wolftail Warriors and ABR12 Arthurian Personalities, and ABR01 Arthurian Command. 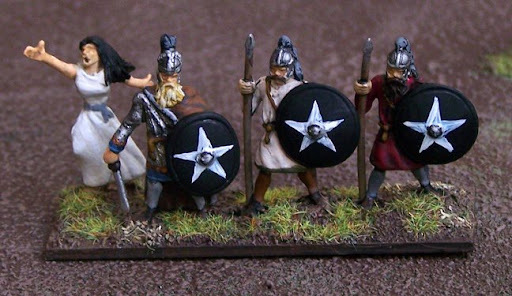 Check out Peter's 28mm Cornwell-inspired armies on his blog.